It often seems that there is nothing British about the BBC other than the money that pays for the licence fee. Am I being facetious? A little, perhaps, but then again the tenor of some BBC programming – BBC3’s ‘Make Me a Muslim’ on Wednesday for example – and its promotion today of the‘Hijab for a day’ initiative does raise significant questions regarding its cultural agenda, for as far as the Corporation is concerned, it would seem that the island of Britain is little other than a geographical space. With respect to this island’s native inhabitants – whom the BBC repeatedly asserts do not exist – its aim often appears not to be the celebration, promotion and protection of their cultures, but of their thoroughgoing deculturisation and absorption either into a transnational cosmopolitanism or even Islam. Its promotion of ‘Hijab for a day’ fits neatly into this programme of deculturisation and alienation of Britons from Britain. 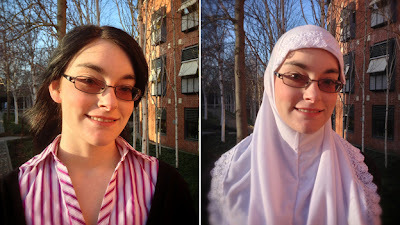 It encourages non-Muslim women (or even Muslim women who do not ordinarily wear one) to don the hijab and experience what it’s like to do so, as part of a bid to foster better understanding. That is the official line of course, but in reality, as any sentient being can see, this is a straightforward method of normalising the presence of Islam and a step towards Islamic proselytisation – Dawah – on a grand scale. As such, it could be interpreted as an act of cultural imperialism and a celebration of Muslim misogyny. The question that really deserves to be asked is this: why is the BBC so persistent in promoting this misogynist system of belief and associated cultural practices? Aaqil Ahmed, the BBC’s Head of Religion and Ethics will have a role to play in this of course, but to lay the blame upon this one man would be totally misplaced and unfair, for the cultural self-loathing of which this is but one expression is deeply rooted within the BBC. If the BBC really cared about the rights of women, it would be promoting the following: ‘World Non-Hijab Day’, a day upon which women around the world who normally wear a veil cast it off for the day ‘and experience what it’s like to do so, as part of a bid to foster better understanding.’ When will we see mass unveilings in Saudi Arabia? Now, that really would be newsworthy! Shall we start a campaign for such a day? Women everywhere deserve it. The BBC should be called to account for its persistent promotion of misogyny, for under the guise of religious 'tolerance', it is attempting to compel us to accept the intolerable. The BBC says: "Women! Know your place!" Its political line certainly is. There are a number of negative comments on the BBC Message Board. I particularly like the one that says he is waiting to see Al Jazeera make one on becoming a Christian. The moderator (Peta) has quite a bit of fielding to do. Please provide a link, Pat! I'd love to add a few suggestions, eg why not wear a ball-and-chain for a day? Direct link to the thread but a lot of editing has been going on, they only show 55 replies now. Obviously the BBC doesn't like criticism. Thanks for the links. As you point out, I can see that some comments have been tampered with i.e. moderated out of existence. World female circumcision day is next. Try it for just one day. Harriet Harman did, and it didn't do her any harm! World Pedophilia Day. Spend one day as husband and wife with a 9-year-old child to experience life as a muslim prophet. World Acid Attack Day - Spend the day dressed as a ninja getting revenge on anyone for the smallest perceived slight. World Honour Killing Day - Similar to the one above, but this is limited to getting revenge on family members you feel have disrespected you in society. World Suicide Bomber Day - Your chance to dress up as a suicide bomber while at the same time arguing that Islam really is a 'religion of peace'. I could go on but I'm sure you get the idea. Please add your suggestions, we can then send them to the BBC I'm sure they will love the idea! Well, I wouldn't be surprised if they were to shortly promote something such as 'World quranic recitation day' on CBeebies. Sadly, there is no shortage of useful idiots around who are more than willing to comply with this ridiculous 'experiment'. I want to see fewer hijabs and niqabs, not more. That's true. In fact, I think I know a few people (in a professional capacity) who'd love to participate. After viewing this programme I'm reminded of the phrase 'the grass isn't always greener on the other side'. Do they really believe that Islam will give them everything they want or need in life? Islam is hardly synonymous with peace, love and caring is it? Rather the opposite is true. I wonder if we will be reading about these women in years to come with stories of abusive relationships and honour attacks? I wouldn't be at all surprised. Anonymous 22.45 - Links are beyond my tech ability I'm afraid...female and oldish with it! However if you go to the BBC homepage and search for Points of View a page will come up with Editor's Choice Points of View Message Board. You will then be given a choice of radio or television. Click on television and search down that. The comments are getting less and less amenable to the BBC so it may not last much longer. It used to be nearly all support/positive once. I think you're right Pat, as the moderator seems to have 'nobbled' some of the comments.